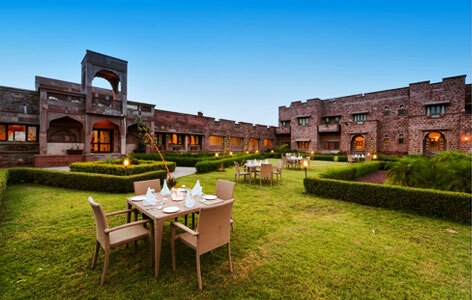 "Located much like a desert oasis, almost 11 kilometers away from the city center of Jodhpur, Bijolai Palace is wonderful retreat with a superbly cool and peaceful environment. However, what distinguishes this amazing resort from others is the time-honored, excellent water conservation system that surrounds this fascinating place. The system works with an efficient mechanism, so much so that the palace is self-sufficient in its water needs. 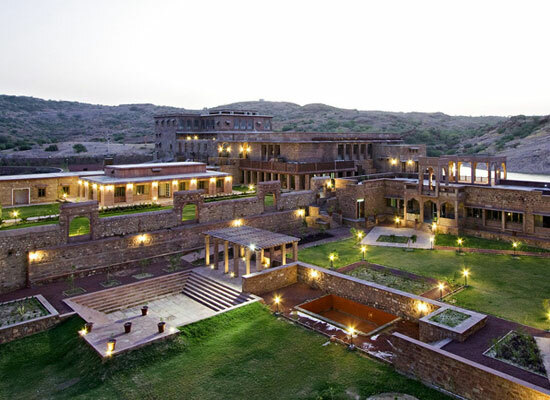 After being handed over to Jal Bhagirathi Foundation in 2002 by the erstwhile royal family, the palace was converted into a tourist retreat laden with modern facilities for guests as well as a Water Resource center to be used an important source of water in this dry and deserted region of Marwar. The fascinating Bijolai palace was built as a summer relaxing retreat by His Highness the Royal Maharaja Takhat Singh (1819-1873). Situated 11 kilometers outside Jodhpur, the palace stands on a small hill and is surrounded by an efficient water harvesting system on almost all sides. After serving as royal retreat for many years the palace was given up by the royal family to Jal Bhagirathi Foundation (JBF), which transformed the palace into a Water Resource Center which houses an NGO and a Water Habitat Retreat which now serves as tourist resort, where they relax and learn about the surrounding areas. The accommodation at the resort is exquisite and all the emphasis has been given to the comfort and luxury of the guests. There are four types of rooms available in residence at the palace-The Habitat Room, The Habitat Deluxe, The Habitat Grand Deluxe and The Habitat Suite. 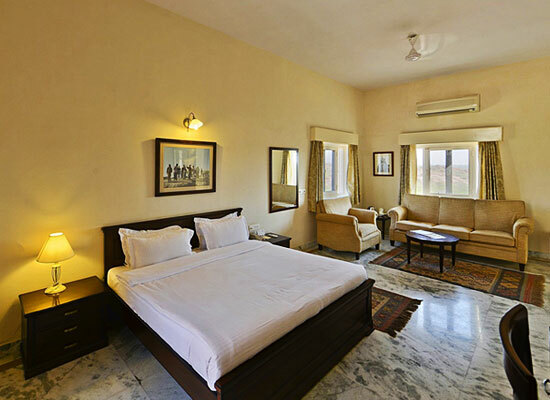 In addition to being fixed all the latest and state of the art amenities, the rooms are embellished with a fine, luxurious décor and affords wonderful views of lakeside and hills. 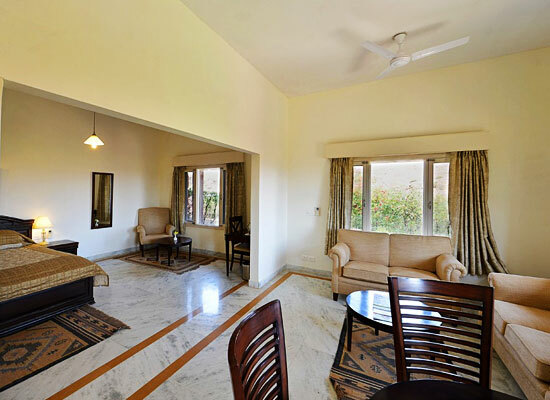 Besides visitors will find other excellent facilities like spacious bathrooms, comfortable beds, separate dining, sitting and dressing space etc. as well, to enhance the experience of their stay at the resort. Dining (area) was given a special emphasis in the overall design and makeup of the palace by the Maharajas, who planned it meticulously according to their royal tastes and preferences. As a result, there are in total of three dining areas where guests can be seated comfortably to enjoy their meal in the midst of cool and scenic surroundings-The Terrace, The Indoor Dining and The Lakeside. The décor of the dining areas wonderfully reflects the harmonious blend between traditional and modern. Minor details are attended to and the settings are clean, exquisite and fresh. 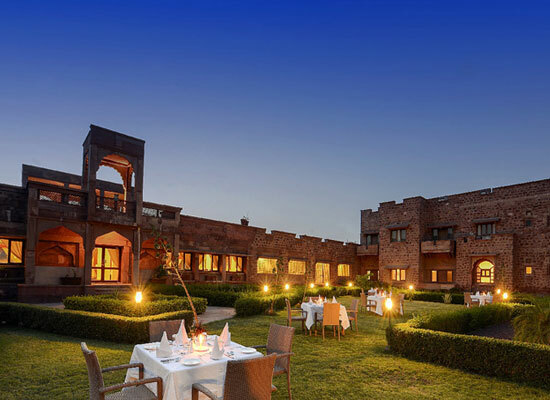 Guests are treated to sumptuous cuisines incorporating rich flavors of Rajasthan and India, across a wide range of recipes. Views of surrounding countryside-of lake, hills and wildlife-make the dining experience at Bijolai much more enjoyable and stimulating. 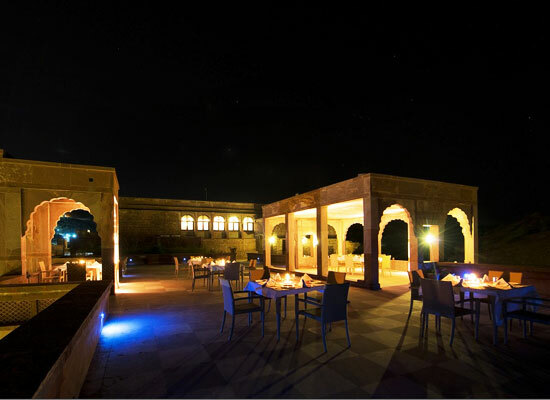 Located at the edge of the “Great Indian Desert” Thar, Jodhpur is an historic city founded in the second half of fifteenth century by Rao Jodha. A jewel redolent with erstwhile imperial magnificence the city features prominent tourist spots like Mehrangarh Fort, Umaid Bhawan Palace, Mandore City and Gardens, Jaswant Thada and Government Museum.